When I first took up fitness walking in the summer of 2005, proper form wasn’t really a priority for me. My primary goal was just to see how far I could walk without getting too short of breath. As my endurance improved however, and my interest in the walking sports grew, so did my boredom with the plain ol’ fitness style type of walking. It felt too rigid and way too slow for me. In my quest to become a more fluid and faster walker, I decided to explore the world of racewalking. Not knowing the first thing about this Olympic sport, I attended one of Dave Mc Govern’s famous World Class Racewalking clinics. I didn’t have the lung capacity to participate in all the track workouts, but I still learned a lot, and by the end of the weekend……..I was hooked BIG TIME! 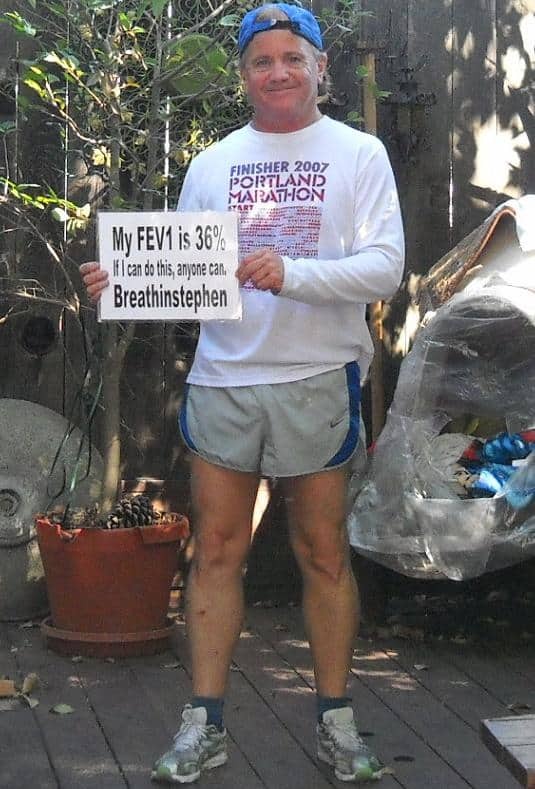 Because racewalking requires pretty much the same amount of lung power as running does, I’m unable to racewalk more than a couple of hundred yards at a time. So, to cover the longer distances, I use a combination of traditional fitness walking methods mixed with intervals of “Legal” racewalking thrown in for good measure. In March 2010, I completed my 4th Dave clinic and my technique continues to improve. I’m now considered by Dave Mc Govern, — a bonafide racewalker! From 2005 through 2011 I completed 12 half marathons and 8 full marathons, including the 2008 and 2009 Maratona Di Roma in Rome Italy, and the 2009, 2010 and 2011 Boston marathons, using a combination of short racewalking intervals mixed with regular fitness walking to cover the distance. As of late 2011, my air trapping and dyspnea have become such a problem that I am no longer able to do the real long walks. I haven’t given up walking altogether though, despite my worsening lung function I still walk at least 1-3 miles everyday, and who know’s, maybe someday I’ll attempt another marathon.